Based on my feelings about violence and our growing desensitization to it as a nation, there is no way I should have read and loved Neil Gaiman's The Graveyard Book as much as I do. Since I began studying and practicing Buddhism several years ago I have become more thoughtful about and sensitive to media violence. The other night I popped in a movie, Brendan Fraser's The Mummy, that my kids and I had enjoyed watching in the past. Twenty minutes into the movie the level of violence and human suffering, even though it was was "fantasy" violence, became overwhelming and we turned it off. The combination of seeing the violence being enacted on and watching the victim suffer was just too much. While I am a huge fan of Harry Potter and own all of the movies, the violence in these seems a few steps removed, although it is increasing as the movies reach the end of the series. Somehow the wand waving and blasts that produce less visible suffering and almost no blood seem less intense than what is shown in The Mummy and Indiana Jones franchises. Even the Star Wars movies, 4, 5 and 6, anyway, are easier to stomach because people are being cut down by pretty blue and green and red light sabers instead of being eaten alive by ancient beetles or chopped up by helicopter blades. I share my feelings on violence and its various levels of gradation with you because, based on what I just wrote, there is no way, as I said above, I should have ever read and loved this book the way I do. And, hopefully by the time I get to the end of this review I will have found a way to make sense of, but not justify, the violent act that is at the heart of this book. Like Harry Potter and all of the great children's book heros before him, the main character of Neil Gaiman's The Graveyard Book (which is a sort of homage to Rudyard Kipling's The Jungle Book) is an orphan being raised by surrogates, ghosts, not animals in this instance. And, like Harry Potter, he has been orphaned because of a prophecy that was made. While Harry's parents only suffered the green light of the unforgivable Avada Kedavra curse, the main character's family in The Graveyard Book suffer a more graphic, realistic death. The first line of the book, accompanied by a graphic novel-like illustration reads, "There was a hand in the darkness and it held a knife." A mother, father and daughter are killed in the first pages of this book. It happens off the page and the act itself is not described in detail, only that the "knife had done almost everything it was brought to the house to do" and that the man holding the knife, Jack, had "left the woman in her bed, the man on the bedroom floor, [and] the older child in her brightly colored bedroom." Yet, as adults, we have heard of many real life stories that end in this same way and it is upsetting no matter how Gaiman words it. But, it is also the engine that gets this story moving. I just have an easier time making sense of death, especially the ways in which it is represented in this book, than I do making sense of violence. But, the important thing to remember is that Neil Gaiman made his name as a sci-fi/fantasy writer of novels and graphic novels for adults and his work is traditionally dark. However, he is also the co-author of the novel Good Omens along with the brilliantly hilarious sci-fi novelist Terry Pratchett as well as Don't Panic: Douglas Adams and the Hitchhiker's Guide to the Galaxy, a companion to the originals. He has also written Coraline, a ghost story for children and now a movie, and Stardust, originally a graphic novel, then a novel and now a movie. And, while I wish whole heartedly that the first chapter of The Graveyard Book (which can be listened to on Gaiman's website - as he toured for the book he read a chapter at every stop and had read the whole book out loud by the end of the tour) could be rewritten to suit my delicate sensibilities, the book that follows is one of the best young adult books published in 2008 and the main character, Nobody Owens, is one of the most compelling, sweetly innocent, profoundly thoughtful young characters I have had the good luck to know through reading about. I loved every minute of his presence on the page, from the saggy diapered toddler who has the good luck to be the "his mother's and father's despair and delight, for never was there such a boy for wandering, for climbing up things, for getting into and out of things," to the boy who emerges at the end of the book, looking forward to finding his way in the world of the living "with his eyes and heart wide open," a world that he himself has made safe to return to. As Nicola Turner says in her review of the book, "This is a story about the power of family - whatever form it takes - and the potential of a child who is raised with love and a sense of duty." Nobody, or Bod as he is often called, wanders out of the open door of his house on the night of the murders, when he is about eighteen months old, and up the street to the local graveyard that is also a nature preserve. Bod is discovered by the ghost of Mrs Owens, a woman who was never able to have children in her lifetime some two hundred years ago, and is immediately taken under her wing. When the killer, using his ultra-keen sense of smell, tracks the baby down and enters the graveyard, the disembodied spirits of the baby's dead parents arrive to beg the ghosts to protect the baby from this killer. Mrs Owens takes this plea seriously and, when the Lady on the Gray, death herself, rides in to give her consent, the baby's fate is settled. He will become the child of Mr and Mrs Owens, granted "Freedom of the Graveyard," and he will be protected by the specters and Silas, a man who is neither alive nor dead and able to move in and out of both worlds and thus is able to supply the baby with food and other necessities. Silas is a member of the "Honor Guard" and can influence people's thoughts, among other things. It is implied, though never stated, that Silas is a vampire. While there is murder, death and violence in this book, there is also much humor and warmth. One of my favorite passages in the book concerns the naming of the baby Bod. Once it is decided that Mr and Mrs Owens will be his parents and he will be an Owens, the rest of the ghosts weigh in on a suitable first name. The baby resembles or reminds each ghost of someone else they once knew in life and the names and associations come flying out causing Mrs Owens to declare, "He looks like nobody but himself. He looks like nobody." "Then Nobody it is," says Silas, "Nobody Owens." Each chapter of the book brings new characters and traditions amongst the ghosts as well as the occasional experience outside of the protective gates of the graveyard. Chapter two, "The New Friend," introduces five year old Scarlett Amber Perkins, who is allowed to roam freely through the preserve and graveyard while her mother and/or father read on a nearby bench. Although the ghosts have been schooling Bod in the arts of fading and haunting, he is seen by Scarlett and they become friends. When he tells her his name is Nobody, this results in her parents thinking she has an imaginary friend when she details her experiences. When Bod tries to prove to Scarlett that he is not making up the things he tells her about, he leads her down into a hidden tomb that is thousands of years old, older than Caius Pompeius, an invading Roman who chose to be buried near the tomb rather than have his body returned to his home country. Once in the tomb, they encounter the triple voice of the Sleer, an ancient force that guards a broach, cup and knife while awaiting the return of the Master. Bod uses his common sense, sense gained from being raised by ghosts, and the two children emerge from the tomb unharmed, but a search has been called out for the missing Scarlett. Scarlett is not allowed back in the nature preserve by her parents, but does get the chance to say good-bye to Bod before her family moves to Scotland. Some of my favorite parts of this book are the attention and care that the other ghosts take with Bod and the love and consideration that he shows them in return. From teaching him to read and write to mending his wounds and giving him romantic advice - this is a very funny bit involving a very wordy, self-involved poet from the sixteen or seventeen hundreds - it's obvious that, as Audrey Niffenegger, author of the bestselling novel The Time Traveler's Wife, states in a blurb on the back of the book, "It takes a graveyard to raise a child." These ghosts are not vengeful or restless. They are simply going on about their business but, as one ghost points out to Bod late in the story when Bod says that he is not scared to die and will be happy to join his graveyard friends, they are without potential. Bod still has the ability to effect change, to make something happen and he should not waste that opportunity. As an adult, and definitely as someone who was once a child, what appeals to me most about The Graveyard Book, as well as with the Harry Potter books, is the unconditional love and regard that Bod (and Harry) are shown by some of the adults in his life. Gaiman's characters are superbly written and their lifetimes and personalities are rich with description, almost making this seem like a work of historical fiction. But, better than historical fiction, like Silas, the story floats between worlds - the past and the present, light and dark, death and life, good and evil. And, despite Bod being safe, protected and loved inside the graveyard, there are dangers within he must take care to avoid. One misstep and Bod, now eight or nine, left in the care of Miss Lupescu, a "Hound of God" (werewolf) who has agreed to act as Bod's guardian while Silas is on an extended excursion, and Bod finds himself passing through a ghoul-gate in the company of these corpse-eating creatures. By far the creepiest chapter in the book, it is provides a little comic relief as well. The ghouls all go by the name of the first corpse they feasted on after becoming ghouls and are constantly referring to each other as the "33rd President of the United States,""writer, Victor Hugo," the "Emperor of China" and the "Lord Mayor of London," among others. Bod is able to keep himself alive with the lessons he has memorized with Miss Lupescu, but it is her appearance in the form of a wolf that truly saves him. Danger returns again when Bod leaves the graveyard to attend school in town and finally, when he is fifteen, with the return of Scarlett and the man Jack, back to finish the job he started. My favorite chapter in the book is the fifth, titled, "Danse Macabre." I had the good luck to listen to the audio of this book, narrated fantastically by the author himself, and was interested to hear Gaiman pronounce "macabre" as "macabray," which is perhaps a colloquial old English pronunciation of the French word. In history, the danse macabre is an allegory on the universality of death and has been represented in paintings over the centuries as well as in music, most notably by Camille Saint-Saens in 1874. In the book, the danse macabre is a wonderful celebration that occurs when a certain tree in the cemetery blooms on a particular day. The mayor of the town collects the blossoms then walks to the town center where s/he pins them on the townspeople. Then, the Lady on the Gray arrives, preceded by a hauntingly beautiful melody, and the dead leave the graveyard to walk into the town center and dance with the living. The preparation among the dead and the joyous celebration of the dance are so festively described by Gaiman that I wanted to hop a plane and find that flower myself. I don't think I believe in ghosts, but, since I was a child I have found them fascinating and Gaiman has gone a long way towards sating that curiosity. I have to end this review - hopefully I haven't given away the whole story, just enough to encourage you to give it a try - with comments on the book from some of my favorite authors who might convince you to read this book if I haven't. The grand (old) dame of British fantasy writing for children, Diana Wynne Jones, author of the Chronicles of Chrestomanci, among many others, writes of The Graveyard Book, "This is, quite frankly, the best book Neil Gaiman has ever written. How he has managed to combine fascinating, friendly, frightening and fearsome in one fantasy, I'll never know, but he has pulled it off magnificently." And, Garth Nix, author of the Abhorsen Trilogy for teens and the excellent Keys to the Kingdom series for younger readers says, "I wish my younger self could have had the opportunity to read and re-read this wonderful book, and my older self wishes that I had written it." I definitely wish I had read this book as a child. It reminds me of something Bruno Bettelheim said in his book on fairy tales, The Uses of Enchantment. He wrote that, when children read books and identify with the characters they are not thinking, "who do I want to be," but "who do I want to be like." (italics mine.) I want to be like Nobody Owens - hopeful, thoughtful, loving, kind and brave. Now that this book has won the Newbery for 2009 it will be getting a lot more attention. If you want to read beyond my thoughts, and read a much better written review that also includes some great additional info and links, check out Elizabeth Bird's review for the School Library Journal webstie written on August 6, 2008. 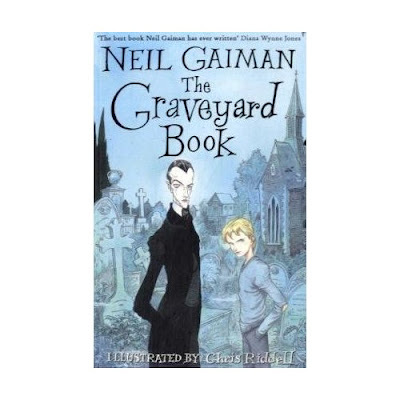 And, one last thing, Gaiman just announced, the day after winning the Newbery, that The Graveyard Book will be made into a movie. It will be adapted and directed by Neil Jordan, best known the movies for The Crying Game and Interview with a Vampire and the adaptation of the Graham Greene novel starring Ralph Feinnes and Julianne Moore, End of the Affair. Below is the cover of the British (children's) edition of the book with illustrations by a favorite of mine, Chris Riddell. Sounds fantastic. I had passed over it earlier in the year because it looked too dark for Ivy, but it sounds like I'd enjoy it myself! I am sure you would like it. It is dark and it's another one of those fabulous books that requires just the right reader. I convinced my son's best friend, a 4th grader and voracious reader with tastes similar to mine, to read it. He hasn't finished it yet, but I think he's enjoying it. I almost feel like I should read "The Jungle Book" so I can appreciate it more. ps - Tell Ivy I finally got my hands on a copy "Savvy" and will review it soon! Thanks for your kind words, When I am at work and trying to convince a parent that it's a great book (in 5 sentences or less) it is a hard sell... It's much easier to write a long, rambling appreciation. What a coincidence: we just finished the Lord of the Rings (sheila drags herself up from the 2 month Brink of Doom it took her to read the thing) and I was about to reach for Graveyard Book, and I JUST quoted Uses of Enchantment on a list, as to why people SHOULD read Aesop's Fables to their kids when they are small (the kids, not the parents). It must be Meant To Be, no? I have had the best verification words today (here: "uncers" and another place: "eutunces." It's like a secret language that I am learning, slowly.